First we’ll cook up the fennel, adapted from a Martha Stewart recipe. Toss together fennel, olive oil, a generous sprinkling of thyme, a tiny bit of sea salt, and a little bit of pepper. Spread the seasoned fennel onto a rimmed baking sheet, lined with parchment paper if you prefer to avoid messiness. Roast in oven for about 45-50 minutes, rotating every so often so it cooks evenly. Let cool slightly before serving, drizzle with lemon juice, and sprinkle with a bit more sea salt, and serve. Enjoy! This was a delicious side dish, with a hint of a licorice flavour from the fennel, and that blended with the thyme, olive, and lemon flavours was an unexpected but oh so tasty result. Now to make the Greek marinated chicken, which pairs perfectly with the fennel, since they both play with similar flavours. I almost devised this by accident, since I had prepped and marinated the chicken for the grill, and then at the last second we couldn’t use it, so we switched to the pan method. This recipe is adapted from the one at The Black Peppercorn. Mix together all the above ingredients, and pour marinate over prepped (cut) chicken breasts. Allow to marinate for at least a few hours, or overnight. Preheat a frying pan on med-high heat. Carefully pour the remaining marinade over the chicken. Reduce the heat to medium, and cook thoroughly, about 10-12 minutes. This will give you some delicious tender, juicy chicken that bursts with Mediterranean flavours. It’s a pretty low-effort, relaxed summer dinner that feels satisfying and fancy, but also light. 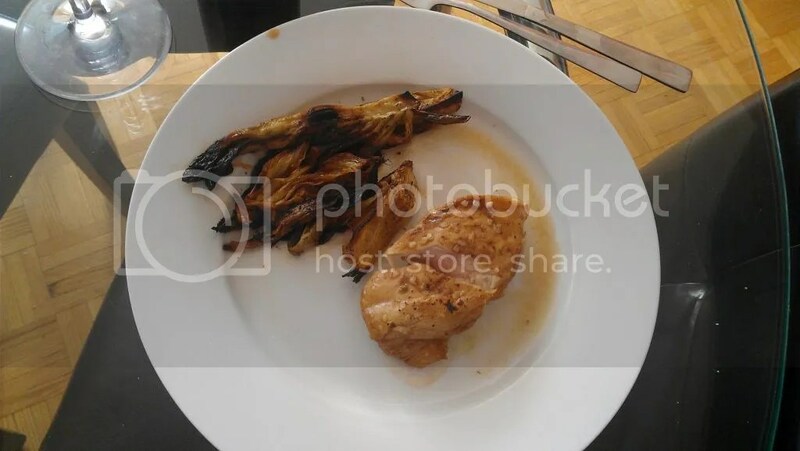 This entry was posted in Food & Drink, Health & Fitness, Recipes, Uncategorized and tagged chicken, dinner, fennel, food, fresh cooking, greek food, summer. Bookmark the permalink.